DeKalb Area Agricultural Heritage Association (DAAHA) is working to educate DeKalb students on the city's barbed wire barons. Currently, DeKalb School District #428 has a booklet that teaches the district's second grade students about Joseph F. Glidden. "The teachers really like the format and commented that it would be nice to have one on other key DeKalb figures," said Donna Langford, DAAHA manager of operations. Dr. Anne Almberg of Founder's Elementary wrote one on Annie Glidden, Ellwood House wrote on Isaac Ellwood, and DAAHA volunteered to do one on Jacob Haish. The booklets are used to meet the curriculum's English Language Arts standards, combining local history with reading and writing exercises. A grant for the schools will cover the cost of printing these materials. 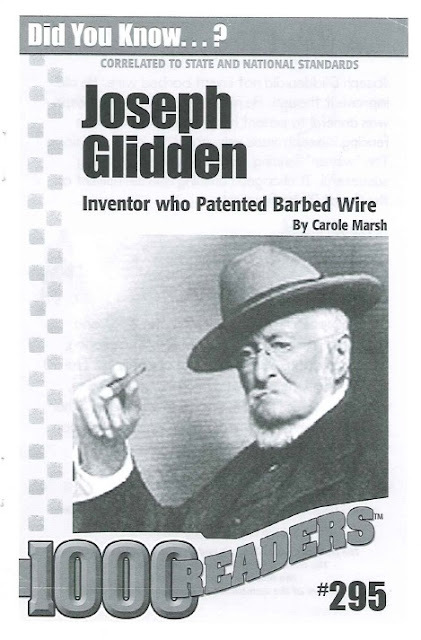 A field trip is also in the works to help further students' understanding of the barbed wire barons, and funding is needed to bus students to these locations: the Ellwood House Museum, the Glidden Homestead and Historical Center, and the parking lot which was once the location of the Haish mansion. DAAHA estimates the total cost is $4,435.31 for eight days (8 elementary schools and 22 classes) to visit these locations. A grant application has been made to help with the 2nd, 3rd and 4th grade busing for field trips.The busing costs for the 3rd and 4th graders is in addition to the $4,435.31. Want to help DeKalb elementary students learn more about the founders of their very own Barb City? Monetary donations are needed to make these field trips happen each year, so hopefully the second grade classes can take this field trip each fall. Any size donation is appreciated for the second grade field trips and will help the grant funds go further for the 3rd and 4th graders. DAAHA is a 501(c)3 and can provide thank you letters to each donor to document the donation to a charitable organization. Please specify that your donation is to help fund the second grade field trips. For more information, email daaha.inc@gmail.com or call 815-756-8737.